Set of three decorative pillows that include 1 each: Roof Tile Pillow, Envelope Pillow and Applique Bear and Pine Tree Pillow. 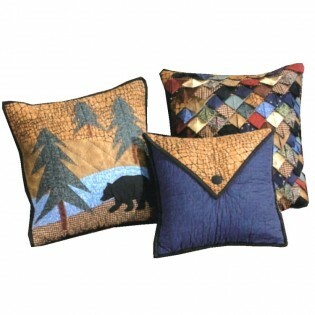 Set of three decorative pillows that include 1 each: Roof Tile Pillow, Envelope Pillow and Applique Bear and Pine Tree Pillow. Roof tile and applique pillows measure 16" x 16", envelope pillow measures 15" x 13".